It was in the well-to-do neighborhood of Anfa, in Casablanca that Jean-François Zevaco built his home and studio (today destroyed). 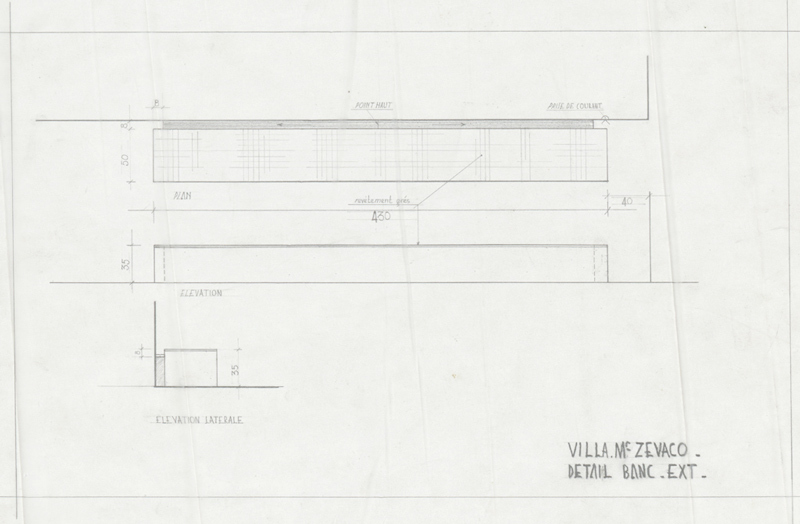 The Villa Zevaco was well removed from the white and exuberant modernist aesthetic of his first Casablanca constructions, and developed the closed and more introverted vocabulary of the residences which he designed in the years following Morocco’s Independence. Developing his constructions from star-shaped plans, he then invented a new architectural language made up of diagonal walls between which there were patios, a living-room, and nighttime areas. In this way, the villa’s plan consisted of many different branches radiating out from a large, round living-room. This dark, cool room, with different levels, in which there were tiered seats, was covered with enamel. Like at the back of a cave, a fountain fed a meandering stream which flowed through the living-room. The only source of light was a large oculus in the middle of the room, over which the architect slid a glass roof or, depending on the weather, wooden trellises filtering the light and calling to mind the world of souks. From this intimate circle radiated the many different dividing walls, which were sloping, and, like so many branches of a star, served the house’s other living areas. All that was visible on the façade was an intermingling of diagonal solid walls, with no apertures. Showing nothing of its interior, the villa, surrounded by rocks, agave plants and cacti, came across like an unmoveable and prickly barrier, whose entrance gate, made of metal thistles (the work of the sculpture Olivier Seguin) was probably the best illustration.